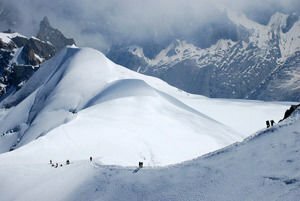 Mont Blanc is the biggest challenge for climbers in Western Europe. This gigantic mountain is by far the most difficult mountain to climb in this part of the continent, but also awakens admiration with its 4810 meters. Mont Blanc is the highest peak in the Alps and in Western Europe. Located on the border between France and Italy, Mont Blanc rises in the Aosta Valley in Italy and Haute-Savoie in France, the French-Italian border passes through its highest point (according to a contract in 1861). The Alps are full of emblematic and majestic peaks, such as Braythorn (4164 m), Eiger, Mont Blanc du Tacul (4248 m) and Aiguille du Midi (4465 m). The incredible natural scenery here is everywhere one looks. Usually the ascent of the Mont Blanc passes through the Mer de Glas glacier, Lake Lac Blanc, "the wall" under De Egyu Gute with the " dead man’s collar", the heights Boss and Wallonia shelter, reaching the Chamonix resort and only then goes to the highest peak in Western Europe. For the first time, Mont Blanc was climbed on August 8, 1786 by Jacques Balmat and Dr. Michel Paccard and is today considered to be fundamental to modern alpinism. They say the route goes to the hut shelter Grand Myule Wallonia. While this is the first route to the summit, today it is not very popular because it is all in the cracks, as expressed by climbers. It is used mainly by skiers. Another route starts from Cervinia - the town at the foot of the Matterhorn . Most of the lower track of the mountain has lifts to save climbers’power. The first woman to climb Mont Blanc was Marie Paradis, which overcomes the 4810 meters in 1808. According to statistics, in recent years Mont Blanc’s annual average climber intake is about 20 000. 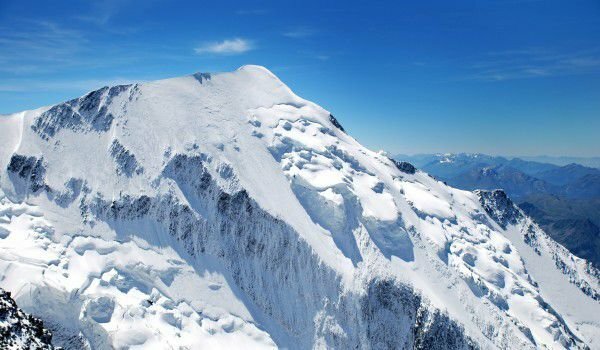 You do not need to be an experienced and professional mountain climber to conquer the top, but need good physical and mental preparation for Mont Blanc, as it can not be called easy to climb. The best season for arriving at the summit is August. At this time of year, local rescue services carry an average of 12 fields every weekend. Mandatory for climbers on Mont Blanc is the best alpine equipment and an experienced mountain guide. The climb poses a danger mostly because the high altitude, combined with the exertion of climbing, which is risky and can cause illness. The lowest temperature recorded on the Mont Blanc was in 1893 and amounted to -43 degrees. The two closest towns to Mont Blanc, which are usually starting points for the ascent of the giant are Courmayeur in the Aosta Valley, Italy and Chamonix in Haute-Savoie, which is where the first Winter Olympics were held. Mont Blanc is covered with snow all year round. In 1891, scientist Pierre Janssen decided to build an observatory on Mont Blanc and attracts Gustave Eiffel to the cause. Eiffel, however, refuses because there isn’t good enough ground, on which to begin construction. However, the observatory of Mont Blanc was built in 1893. It was operational by 1906, when the building begins to distort, and three years later the movement of a crack causes the mountain observatory on Mont Blanc to collapse.